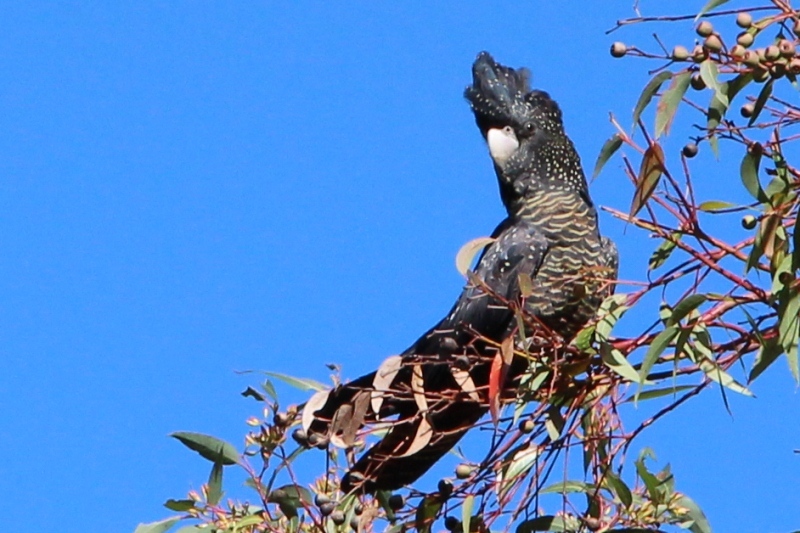 Over the last couple of days I have been hearing the breathy screeches of the Red-tailed black cockatoos, but they are really hard to see in the trees and almost impossible to photograph. 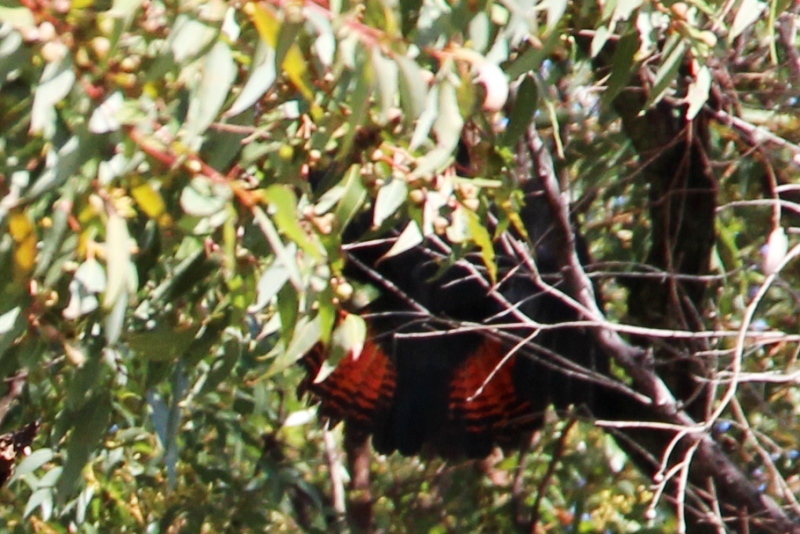 When going to let the chooks out at 11, there was a small group of 3 in a Jarrah tree near the coop and I managed to capture some images. It is the first time I have seen a female up close and was surprised to see the yellow spots on the sides of her head and the pale scalloped look of her breast feathers. It was possibly a family group as it looked like a male and female with a juvenile. The males have broad red tail panels that are only visible when taking off or landing and the females have barred red tails. 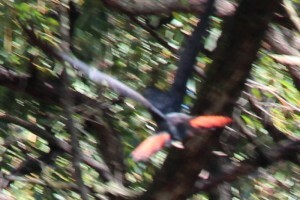 The Red-tailed Black Cockatoo is monogamous and pair bond for life. Breeding can happen at any time of year but occurs mainly in spring and autumn. The usually singular egg takes 30 days to hatch and the young stays in the nest for another 80 days. The young bird is fed by exclusively by the parents for another 4 months and the parents will continue to feed the juvenile until it learns how to get the seeds out of the Marri nuts, which can take a year. 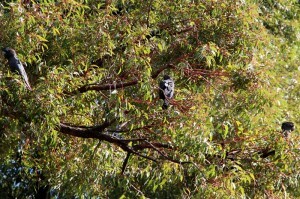 Interestingly, breeding varies between years and is thought to be related to the level of Jarrah and Marri fruiting. This year I noticed that the Marri flowered later, or for longer, than last year and had a lot of nuts, so hopefully it was a successful breeding year. Like all the big parrots, they can live for up to 50 years. Like the endangered Baudin they are a threatened species. In the state they are listed as “Vulnerable: Schedule 1 – Western Australian Wildlife Conservation Act”, and nationally listed as “Vulnerable: under Federal Environmental Protection and Biodiversity Conservation Act”. They used to be common, but are now classed as rare to uncommon and only patchily distributed over a reduced range. They are usually seen in pairs or small flocks. As with many other native species, the population has declined due to destruction of forests and woodlands, unseasonal burning and competition for nest hollows with feral European honeybees and ducks. We have both ducks and bees nesting in the forest and I hadn’t realised that they were an issue. A naturalist advised us to exterminate the bees, which seems counter intuitive as they are always busy pollinating the flowers of the marri trees. Unlike the Baudin cockatoo they are happy eating the smaller seeds of the Jarrah tree. Their bills can’t get in to the Marri nuts, so they chew the edges off them. The West Australian Museum has produced a great factsheet that shows the marks the different parrots leave on the Marri nuts as they try and eat them. 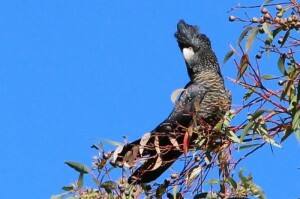 Apparently 90% of the Forest Red-tailed Black Cockatoo’s diet is made up of the seeds from Marri and Jarrah fruits. 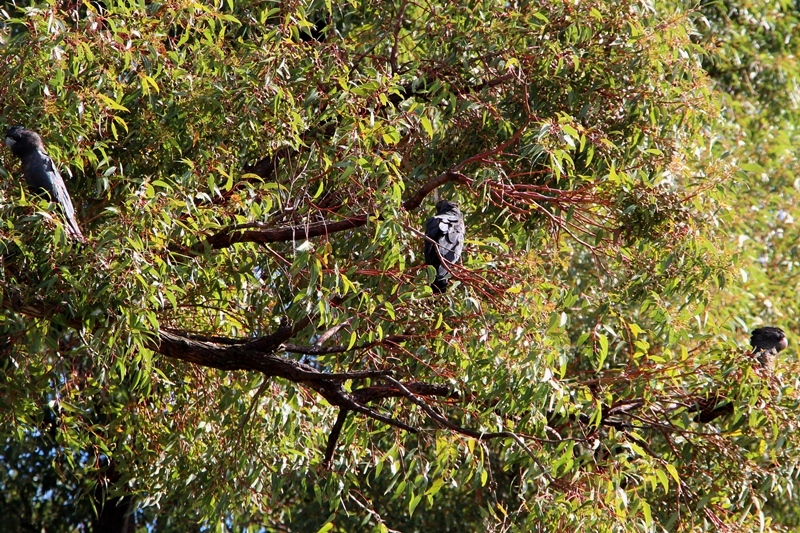 They also eat sheoak, snottygobble and spotted gum, so with the 4000 spotted gum we have planted – they should have plenty to eat here.